On September 20, 2016 Apple will release its next generation operating system, macOS Sierra. While Apple may think it’s great that the Siri enabled Mac do “even more for us, so we can do more with our Mac”, as an organization, we may not be quite ready to introduce macOS Sierra into our environments. If you you’re looking at your calendar trying to figure out if you’re going to be able finish validating your AV and your critical business applications are fully functioning with macOS Sierra, you can use LANDESK Security Suite to temporarily block the installer from running. Going this route will give you the extra days/weeks you need to finish validating the OS without having to worry about who is going to install the update and be calling you tomorrow wondering why their VPN won’t work. 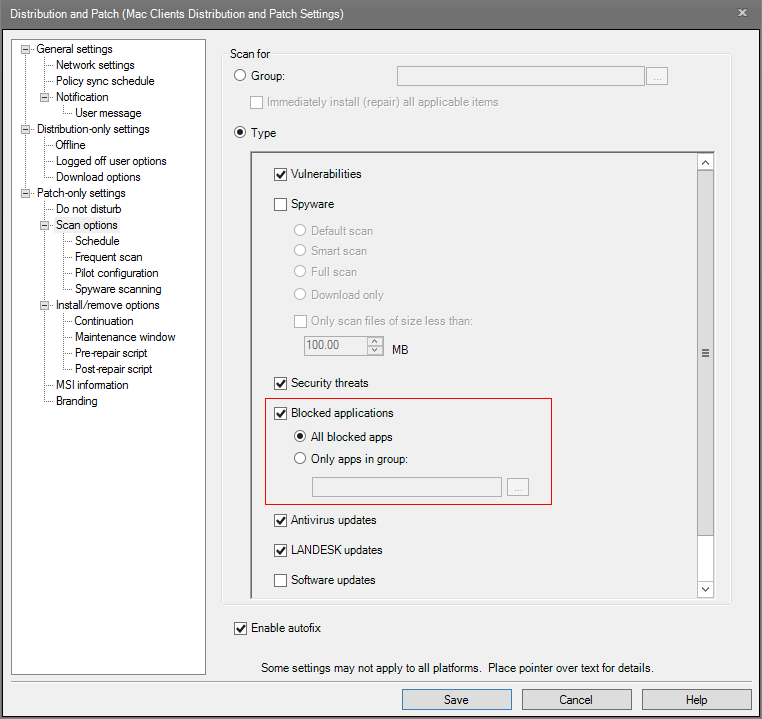 The process to block an application in LANDESK Security Suite is quite easy and should only take you a couple of minutes to setup your policy and get it deployed. From the menu bar, select the first button that may be titled All Types, but could be Antivirus, Blocked applications, Custom definition, Driver, LANDESK update, Security threat, Software update, Spyware or Vulnerability. Select Blocked applications if not already selected. Check the box at the bottom that says Mac and uncheck the Windows box. 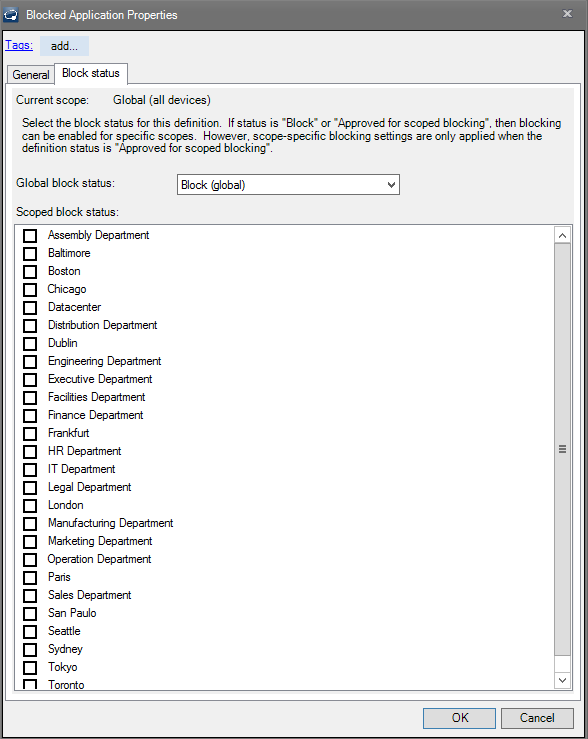 If you don’t want to block the installer globally, click on the Block Status tab at the tab and select which Scopes the restriction should be applied to. Open the Distribution and Patch setting assigned to your Macs. If you have more than one, edit each one respectively. 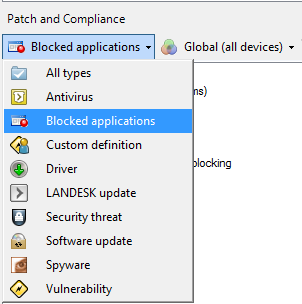 Go to the Scan Options section under Patch-only settings and make sure the Blocked applications checkbox is checked. At this point, your machines will automatically receive the change and begin blocking the macOS installer the next time a security scan is initiated. If you created an entirely new Distribution and Patch setting, different from the one currently applied to the Mac, you’ll need to create a Change Agent Settings task. 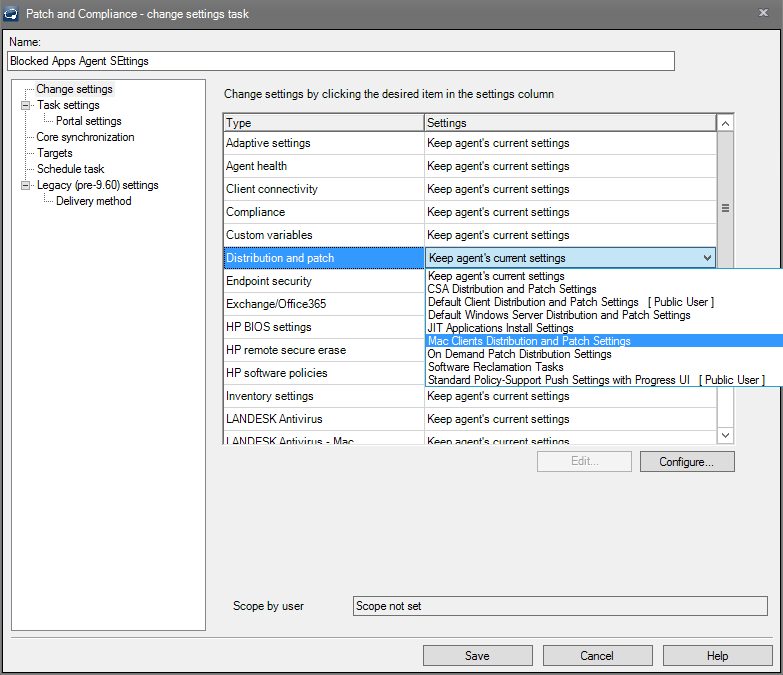 Find Distribution and Patch from the list on the right hand side of the panel and click on the corresponding Keep agent’s current settings. 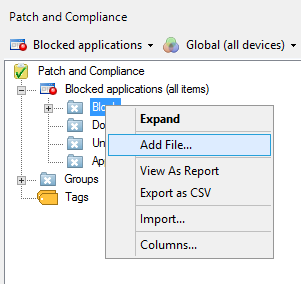 Find your newly created Distribution and Patch setting and select it. Now set your desired Task Settings (policy, push, policy supported push) and desired portal settings (required, recommended,optional). I used a policy-supported push and required. That’s it. 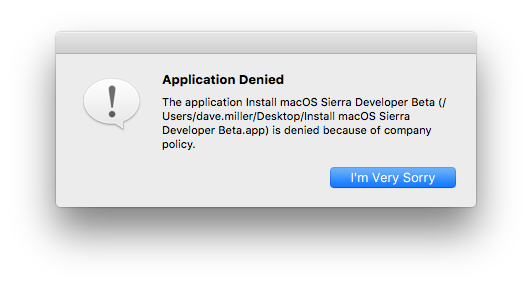 Now, whenever someone attempts to launch the macOS Installer they’re going to get a nice Application Denied prompt like the one below. As a result of Cylance’s success, I’ve recently received a number of requests from customers asking how they can silently install the product with their specific, company-unique token. Luckily, accomplishing a silent install of Cylance Protect is a fairly simple process. I’ve written a basic script that will accomplish the task for you. One particular customer sent a reply back to me after using this script, stating the “Cylance deployments went great!! !” Hopefully your deployments can go as smooth as theirs. Furthermore, because this script leverages the LANDESK SDClient tool for the download, you will still benefit from bandwidth controls and you’ll be able to leverage the peer sharing if your store your package file into the sdcache folder. For simplicity, I’ve chosen to write my package to the same folder as where I’ll write my token file. Because the token file can be read with any text editor, I’ve chosen to store my data in a private folder; which means I will only benefit from LANDESK’s bandwidth controls, but I figured it was a good tradeoff for me. I just didn’t want to put the license key into a folder that people might be accustom to look at. Break out your favorite Text Editor (TextWrangler or XCode is what I use) and let’s get started. I’ll break the script down into sections for easy understanding. The first part of the script contains your obligatory declaration indicating it’s a shell script as well as some comments as to what I named the script, when I created the script and what it does. Besides the very first line, everything is optional. #  Created by Bennett Norton on 8/30/16. The next part is where you’ll set the variables used throughout the script. You’ll need to supply the custom Cylance token, the package name, the location of where the package will be stored on your HTTP share and the location to where you’ll want to store the package and Cylance token on the client. It’s likely that you’ll be able to leave the cylancePackageName and cylancePackageAndTokenDestination variables as is, only modifying the cylanceToken and cylancePackageLocation variables. Just repalce the text betweent the quotes. The next section of the script detects if the folder for where we will store the package file on the client exists and if it does not, creates it. You may want to enhance this part of the script on your own to delete any files inside if it does exist, I have not added that in, but it may be a good idea. echo "Location doesn't exist. Creating directory"
You shouldn’t need to adjust anything within the next phase of this script. This step is simply creating an output file of the token to be used during the install. The next step within our script is to download the installer package. This piece is specifically tailored to LANDESK Management Suite and uses SDClient as the downloader. If you don’t have LANDESK Management Suite, alter this part of the script to use CURL. /Library/Application\ Support/LANDesk/bin/sdclient -noinstall -package "$cylancePackageLocation/""$cylancePackageName" -destdir "$cylancePackageAndTokenDestination"
We now need to unzip the package file and install the package using OS X commands, which means this code is generic, not specific to LANDESK Management Suite. Finally, let’s clean up after ourselves. The final command in our script will delete the entire /tmp folder. 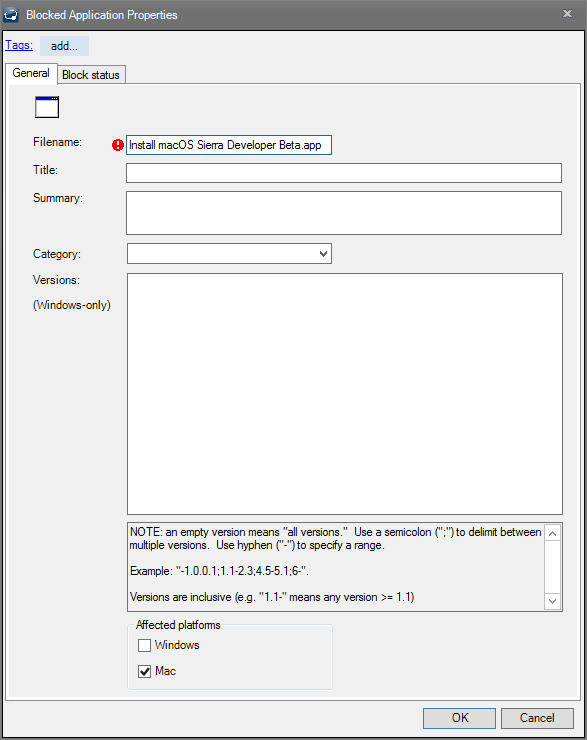 As I mentioned with the folder detection, you may want to do some detection logic to see if the application exists in the Application folder prior to deleting the folder, that’s up to you. And that’s it, you now have a fully functioning script you can use to silently deploy Cylance Protect in your environment. For ease in the copy and paste process, here is the entire script. At this point, you need to save your file to an OS X machine, if you’re not already on a Mac. Make sure your file extension is .sh as well, I saved mine as CylanceSilentInstall.sh. Assuming all goes well and Cylance Protect installs, you’re ready to zip up your script and copy it to your HTTP package share. Now you just need to build a LANDESK Mac package and deploy the package to your target machines. On the Distribution menu bar, press the New Package button and select New Macintosh Package. I often find myself laughing in regards to the overreactions we make in today’s world, where every opinion can be so easily spread – especially if there is any type of political current. As of late though, my laughing has subsided and I find myself much more concerned. Unfortunately for the majority of us whose opinions’ fall in the middle of the extremes, our voices are typically too quiet and often drowned out. I write this blog today knowing it’ll probably be read by 10 people, if I’m lucky. But I do it anyway to speak on behalf of the group I feel I fall into and that is the silent majority. And, because my blog is about Apple in the Enterprise, I want to do my part to inform the businesses that may be unaware, or wrongly informed by the media, that they can indeed get access to the data on the corporate devices they own and assign to employees. Now, first off, before I get into the method of how to unlock an iPhone, let me express my opinion on this political side of the issue. I personally believe the FBI’s request to un-encrypt the encrypted iPhone used by Syed Farook, the San Bernardino terrorist, is a red herring. Yes, having access to Syed’s corporate device may prove helpful, but at what cost? The FBI is using this terrorist act as a catalyst to find a way around the iPhone’s encryption for much more than just this single incident. Just look at this article in The New York Times, Justice Department Wants Apple to Unlock Nine More iPhones. Apple is losing the PR battle on this and they shouldn’t be. This isn’t just about one phone, this is about you and your privacy. Apple is arguing its First Amendment rights regarding this, and we should all be standing behind them. Think of all of the common individuals, like you and me, that will be put at risk if a backdoor to our personal data were made available by Apple. The FBI will not be the only entity that will eventually have access to such a tool. Even with Apple’s best and brightest working on a solution, nefarious individuals, companies and governments will find a way to use such a backdoor. Do you remember the LA hospital that was paralyzed by hackers that made the news last week? A backdoor to our phones will only make it that much easier for all of us to have our personal information put at risk and potentially held hostage. Donald Trump and possibly even Bill Gates disagree with me on this, depending on which report you believe. As for me, I’m against it. In the lexicon of Donald Trump himself, it is such a bad, bad, bad idea. I place a lot of value on respect – especially regarding my privacy. And I extend that wish for privacy and respect for me, for my family, for my neighbor, for those who also live in the great state of Texas and every other individual that believes in our basic unalienable rights. The FBI’s use of fear to override our basic rights is not a viable option – especially when the cost is the privacy of millions of individuals. Stewart Brown in his article in The Washington Post titled Has Apple made iPhones illegal in the financial industry? has it wrong, or missed a major piece of the picture. The collateral damage isn’t just a corporation (which can somewhat protect itself), it’s primarily you and me. Seriously? We have a law to monitor all electronic communication? Good luck trying to enforce that. With that, I don’t know the history of the law, nor do I have the full context of the law. It may have good intentions, but it compromises our privacy and puts us at a security risk. Data in motion is encrypted for our own security. We already have enough issues with our data being stolen and misused to think that we should un-encrypt all data so it can be monitored. Really, this whole thing is crazy and worrisome. We have laws that make us vulnerable and governments that ask companies to remove what protections we do have. We need to stand up now, before we don’t have the freedoms to protect ourselves any longer. Luckily for us “commoners,” there are plenty of others that feel the same way we do, both public and private figures. Now it’s time to discuss how corporations can unlock the phones they own. Apple and Google have put protections in place for corporations, giving them the ability to remotely “unlock a phone.” The caveat is simply that it must be a managed device. Any MDM (Mobile Device Management) vendor can unlock a managed device in seconds. That’s right, in seconds. My Dad always taught me that with the right knowledge and tools any job can be easy. 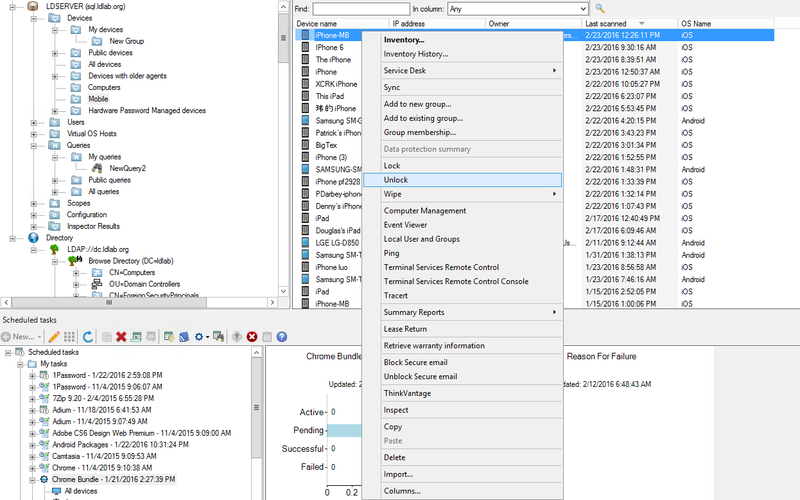 Unlocking an iPhone managed by LANDESK Management Suite is literally a two-click process. All you have to do is find the phone in network view, right click on it and select Unlock. And just like that, the phone’s password, and if applicable, fingerprint protection, will be removed. I understand that not every terrorist is going to use a company phone that should be managed prior to a terrorizing event. However, had the San Bernardino County Department of Public Health not neglected its duty to protect itself by managing the devices it assigns out to its employees, we wouldn’t even be having this conversation. The county would have been able to unlock the phone for the FBI, and the FBI would still be trying to come up with some other excuse to tear down our privacy protections. As a people, both as public and private individuals, we shouldn’t be attacking Apple for having put in place privacy protections for all of us. We should be focusing on the negligence that is putting us in the tough spot to begin with, in which the proposed solutions steal away your own rights to privacy. Hard Drive Encryption for Your Macs is Free From Apple – Why Aren’t You Leveraging its Protection? 2014 and 2015 have been monumental years when it comes to data breaches and the costs incurred by the business entity for those breaches. According to a study released by IBM and the Ponemon Institute, the average total cost of a data breach increased to $3.79 million dollars in 2015. While Sony Pictures Entertainment, JPMorgan Chase, Target, Ashley Madison, and the U.S. government are high-profile customers, it only takes one forgotten laptop in the back of taxi cab or left in the airplane back pocket to put you in the sites of a possible attack. Now, data breaches have many causes. 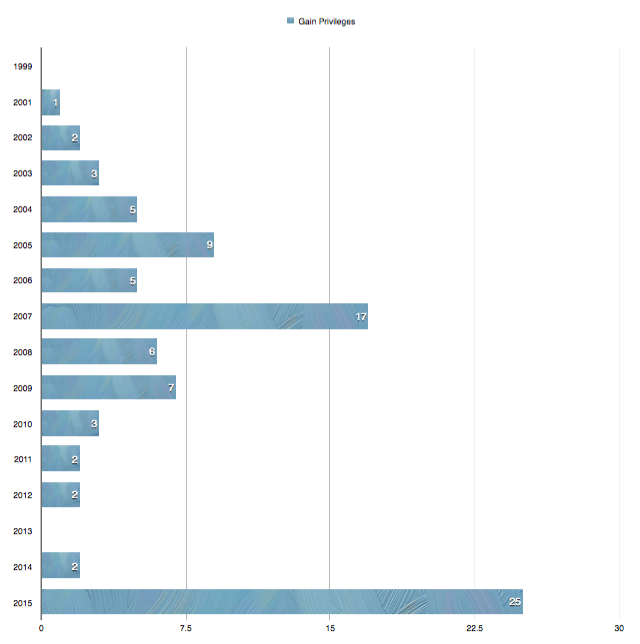 Hacking, whether by brute force or social engineering (think skimming or phishing attacks) incidents are by far the most popular means for getting to your personal or corporate data. However, in second place, coming in at 15% of all data breaches, is the category of employee negligence – of which is included lost/stolen devices. What’s crazy is that while you can’t prevent people from being forgetful, or prevent humans from stealing from one another, you can prevent your data from being accessible if one of your devices ends up in this situation. So how is that done? It’s done by encrypting the hard drive so it’s contents cannot be read without the decryption key; which is your logon password, so it’s not like your end users have to remember anything unique. And, conveniently for you, built directly into OS X, for free, is FileVault – the premier hard drive encryption tool for your Mac. All you have to do is enable it and reap the benefits of its protection. Without an encrypted drive, all one would need to read all of the data from a stolen/lost laptop would be a screw driver, a $20 hard drive enclosure, a computer and about 30 minutes of free time. Do you know of anyone that might have all four of those ingredients? We all do, right? Retrieving data from a device is not rocket science. Okay, knowledge of why you need to encrypt your hard drives is only going to take you so far. How to encrypt every Mac you have is just as important, if not more so. Built into LANDESK Security Suite 2016, released on Friday, February 5th, is the capability to not only enable FileVault remotely, but to capture the backup encryption key just in case your users forget their logon password—and we all know that for some people, remembering their password is as complicated as rocket science. Follow the brief steps below or watch this walk through video to learn how to leverage LANDESK to encrypt your Macs and manage your FileVault keys. Then, sit back and rest a bit easier knowing when the next laptop from your corporation is lost or stolen, you’ll know the data is encrypted and safe from prying eyes. Note: Ensure you’re downloading Apple Mac Security Threats in the “Download Updates” portion of the patch manager tool if you don’t see the FileVaultActivation-10 ID. Apply your desired task settings, decide if you’re going to make it required or make available via LANDESK Workspaces, add your targets and schedule the task. Once the client devices receive the task, a prompt will display letting the user know encryption has been enabled asking the user to restart so that the process can commence at the next login event. At the next login event, the active user will be enabled for FileVault. The machine will then restart. Login to the pre-boot screen with the authorized account. The authorized user can now use the machine, however it may be a bit slow as the encryption processes finishes. Status can be seen by going to Settings > Security & Privacy and clicking on the FileVault tab. If additional users on the device need to be enabled, the first FileVault authorized user will need to enable the accounts by clicking on the Enable Users button on the FileVault tab in Security and Privacy. The account passwords for the additional accounts will need to be entered to complete this step. If desired, run an inventory scan to see the updated FileVault status in inventory. This step is optional as the regular inventory scanner schedule will send the updated status change automatically. 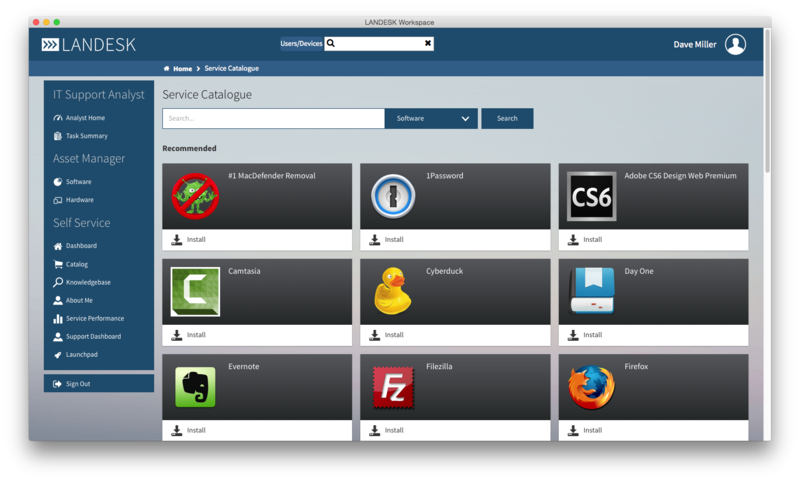 Return to the LANDESK Console and go to Configuration > Client Data Storage to view the key stored for the client. Over the weekend I was troubleshooting a machine in which Safari was being highjacked by a visual pop up and audible voice indicating the machine had a MAC iOS Alert. The malware was completely taking over Safari and wouldn’t allow any other tab to open. The message on the screen essentially said there was a security update to fix an SSL connection and said I just had to call the “Apple Support” number. Even if you hit the OK button, you were stuck. The only thing that could be done was a Force Quit on Safari. Red flag alert! Don’t call the number. I know those of you who are LANDESK admins won’t do it, but for anyone else that may stumble upon this article, DO NOT call the number on the screen and DO NOT pay them any money. For information on how to remove Mac Defender, I looked at Apple’s article on removing Mac Defender but it was for 10.6 and earlier and didn’t help much. My machine was on 10.10 so I kept searching and ended up using this article on StackExchange. I then relaunched Safari and all was well, Safari was back to normal. If you’re a LANDESK customer and want to deploy a script to remediate more than one machine, copy the code below into a shell script. Just set the execute permissions on it and copy it to your distribution repository. Since these folder locations are inside the user’s profile, creating a deploy package may be a bit more difficult if multiple profiles exist on a single machine. It may be best to create an optional package and publish into Workspaces. On the Distribution menubar, press the New Package button and select New Macintosh Package. With the malware removal package created, just schedule a task for deployment. Set the desired Task type under Task Settings as to whether you want a push, a policy or a hybrid of the two types in a policy-supported push. Set the radio button in the Portal Settings to either Recommended or Optional. You’ll also want to check the box for “Allow users to run as desired (keep in portal after selected) so they can execute the script multiple times if need be. Do you think it’s time to remove Adobe’s Flash Player from your OS X boxes? 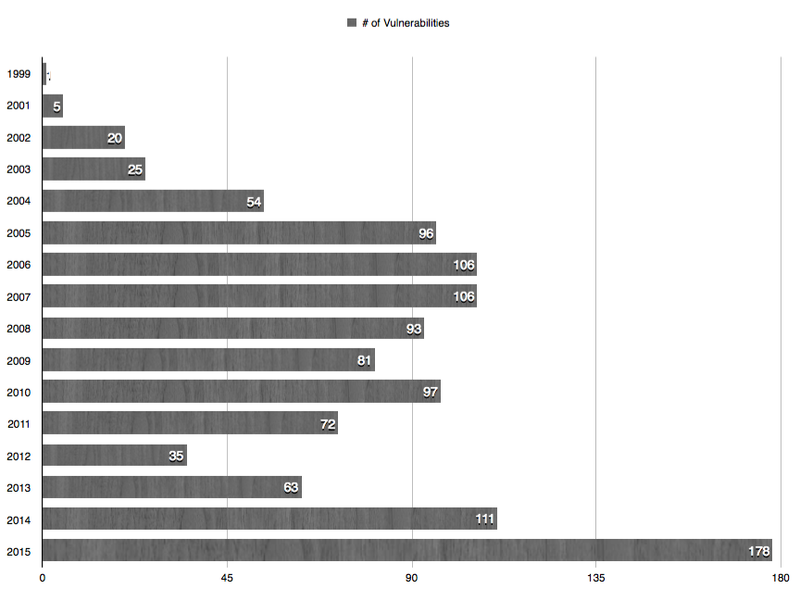 One glance at the Common Vulnerabilities and Exposure’s latest update should get you motivated! If that doesn’t work, check out Ars Technica’s latest blog on the details of the two 0-day exploits. It is passed time to remove Flash. Get it out of your environment and get it out now. Luckily, removing Flash is not very difficult. With the simple script below, Flash can be quickly relegated to the depths of trash bin, never to be recovered. "/Applications/Utilities/Adobe Flash Player Install Manager.app"
Step 1 – Create a “Remove Adobe Flash” folder structure and build script for the PkgBuild utility. Insert the code below for your “package_the_script.sh” script, changing your identifier as needed. Once saved, run the command “sudo chmod a+x package_the_script.sh” to ensure execute permissions are set. You may also want to sign the package if using Gatekeeper. Step 3 – Create the Remove_Adobe_Flash Package by opening Terminal and browsing to wherever you saved your package_the_script file. Once there, type “sudo ./package_the_script.sh”. So doing should create your uninstaller package. Now, zip the pkg file and copy it to your software distribution share and build your LANDESK deployment package. To validate your success, browse to http://www.adobe.com/software/flash/about/ on the machine and you should see that the plug-in is missing.